Who celebrates Day of the Dead in the United States? You are here: Home / Holidays / Day of The Dead / Who celebrates Día de los Muertos in the United States? WHAT GOES ON AN ALTAR? Who celebrates Day of the Dead in the U.S., and why? Golin, a worldwide public relations agency, conducted a nationwide survey of Hispanic adults in 2012 looking at who celebrates this holiday in the United States, why, and how they celebrate. 28 percent of the people surveyed said they celebrate Día de los Muertos (Day of the Dead). The top three ways in which people celebrate this holiday include buying or baking pan de muerto (25 percent), visiting a cemetery (21 percent) and building an altar (17 percent). The top five reasons why people said they celebrate Day of the Dead include family togetherness (52 percent), maintaining traditions (51 percent), the food associated with the traditions (46 percent), teaching the traditions to their children (39 percent) and having the ability to share the best of both worlds of their Latino and American heritage (37 percent). Where are people celebrating Día de los Muertos? Of those surveyed, 37 percent lived in the West, 29 percent in the Northeast, 27 percent in the Midwest and 21 percent in the South of the United States. Excellent post and a very interesting one too. It’s very interesting to know that more and more people are indeed celebrating their families in this manner. Thanks for the info. I will be posting my offering later this afternoon. Thanks again. So I have never celebrated this day. I was just asking my friends yesterday about the history and if they celebrate here. Thanks for sharing. We love Dia de Muertos, even though we haven’t had a chance to put up our own altar yet. More logistics and travel schedules than anything else! But, we got our faces painted as calacas this year and my daughter and I have been doing crafts, reading books, playing apps and so much more. Having lots of fun with it! We have celebrated DotD for many years now. 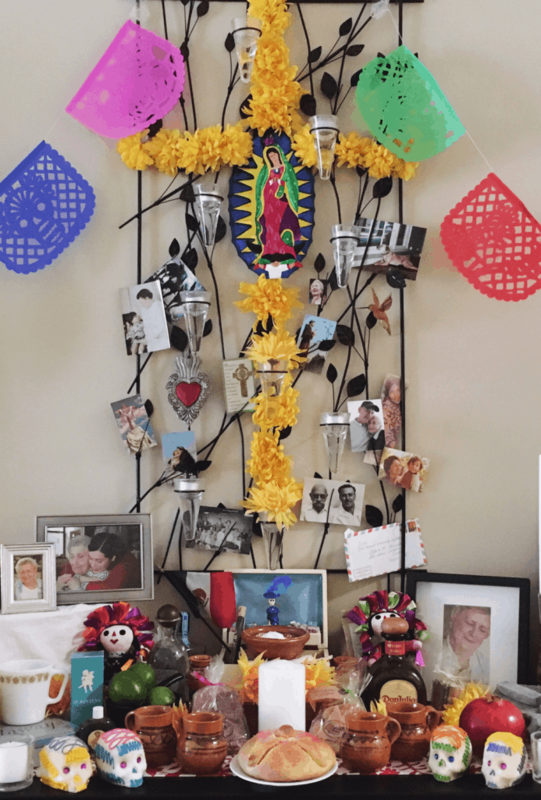 I always put up an altar, even though it is pretty simple: a pretty cloth, photos of loved ones – or their names if we have no photos – and some fruit and pan de muerto, which we make ourselves. On November 1st evening, we make hot chocolate (spiked for the grownups) and if I have some, light copal incense. We talk about our loved ones and tell stories about them and break bread with them. My children are small, so it’s been a time for us to talk more generally about death as well. This is my first DotD in Oaxaca, and Ive been enjoying the festivities greatly. That is a great infographic. So true re: the changing landscape. I didn’t do anything to celebrate this year. I did take a moment to share the holiday with my kids and I showed them some pictures of the faces of skeletons and they were very intrigued by the holiday. Well, we have made altars, buy pan de muerto, decorate calaveras, put up papel picado and make paper flowers. I go into my children’s classrooms to share our tradition by reading them a DotD book, sharing our altar, and making paper flowers. This year other parents are helping in my older child’s classroom and we are decorating calaveras, most of the children are making altars at home and bringing them to share at school. We are making paper flowers, eating pan de muerto, and we might even paint their faces like calacas. We also celebrated at our Botanic Gardens where they had a big fiesta!!! So much fun. Definitely see it growing here in the States! Gracias! Oh, so I suppose we celebrate for the same 5 top reasons. I’ve been having a good Dia de Los Muertos year…. as far as projects are concerned…. made an alter, sugar cookies and a big rice Krispie treat all in the name of DDLM. Cool piece. I am a Spanish professor in a community college in Texas and I teach my students how to celebrate the Day of the Dead on this side of the border. I myself go every year to San Antonio to celebrate this Mexican holiday. This fiesta allows us to be close to those family members who are not with us and to understand and appreciate the beauty and the natural cycle of life. Great information! I have never observed Day of the Dead, although I love Halloween, and actually enjoy it in more the Day of the Dead spirit than that of Halloween. I do enjoy dressing in costume, and wearing makeup. I like the demonstrations of drawings on the face. There are lots of Mexican restaurants in my neighborhood, but I want to have my own personal celebration in memory of departed loved ones. I live alone, and I see no reason to let that deter me in celebrating. I am native of Georgia, where I still live. This is a simple comprehensive list of suggestions to guide me to create my own private tradition. Thank you for teaching me a unique way to honor my departed loved ones, including pets. We started celebrating Day of the Dead last year with friends. This year we skipped Halloween. I like the celebration of family. I learned how to make sugar skulls, bread of the dead and im trying to make pumpkin candy. The event involves lots of local school children and young performers, as well as professional dancers and musicians. The community altar display is truly moving, and visitors may leave behind messages to deceased friends and family. It is a great way to honor and remember lost loved ones.